There was a lot going into the highly anticipated Fourth Season of Arrested Development when all fifteen episodes launched simultaneously on Netflix six months ago. Would they be worthy successors to the impeccable first three seasons? Would they managed to maintain a high level of twisty plot while separating the primary cast into their own individual-centric episodes? Would there be a heady amount of symbolism centered around a certain enormous flightless bird? We probably weren't thinking about that last one when we went into this whole thing. One of the stranger bits about the Netflix-only episodes of Arrested was the ubiquitous presence of ostriches. It seemed like such a bizarrely random animal to include in almost every episode appearing to almost every character. I couldn't really find a good explanation online, so as a proud American, I did my own research and looked up three possible reasons along with the proper instances of each. Bluck bluck. 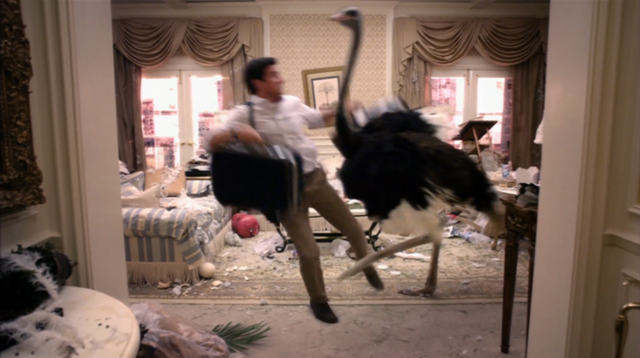 At the end of "Flight of the Phoenix" (S4;E1), Michael is nearly run over by an ostrich upon entering his mother's (former) apartment at the Balboa Towers. This is after incorrectly guessing that the destruction of the interior was caused by Buster or Gob when it was really Lindsay. In turn this is representative of Michael's continued feeling of superiority, when really, he has no idea what's been going on with the rest of the family. 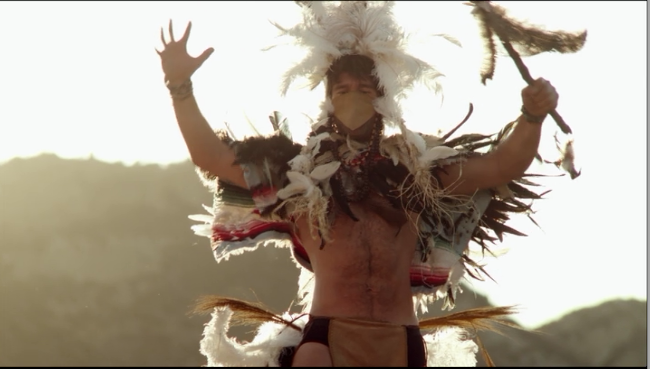 In "Indian Takers" (S4;E3), Maebe, while disguised as the Indian shaman, literally tells Lindsay to pull her head out of the sand. At the time, Lindsay was on a "quest for self-discovery," although she isn't acting any differently. Likewise, Shuturmurg, India is hindi for "ostrich," which fits in every category we'll present today. When Lindsay, Tobias, and Maebe are all there at the same time, no one realizes that anyone else is there. There is a very quick moment in "Queen B." (S4;E10) where Lucille admits that the last time she cried was when she found her dead ostrich. She's cut off due to Tobias' own ignorance - the one time where she actually has the breakthrough he's been trying to pry out of her, Tobias is caught up in his own delusions of theater stradom as well as forming a doomed relationship with DeBrie. In "Señoritis" (S4;E12), it's revealed in a quick shot that the mascot of the high school that Maebe is currently attending is the "Ostriches." While Maebe was always fairly successful, if not just conniving in the original run of Arrested Development, she begins Season Four stuck in a rut in High School. As years go by before she realizes just how far behind she's fallen, there's no better representation of her arrested development in high school then an ostrich, who would rather pretend everything is fine than do anything about it. Hey, that's the name of the show. There is also this bit from "Off the Hook" (S4;E14), which presents a joke ostrich that looks a whole lot like Buster, along with the manipulation of Lucille Austero. Lucille 2 uses Buster's weakness to juice to cause him to miss his mother's trial, to the detriment of her rival Lucille. Buster's whole life is delusional and sheltered without any real world skills or means to support himself, a perfect ostrich. In "Indian Takers," Maebe's appearance as a shaman to her mother, Lindsay is mostly to get her delusional mother to pay attention to her. When she is seemingly replaced with an ostrich near the episode's end it captures the idea that she has completely (as is typical) forgotten about her child. In "Double Crossers" (S4;E6), Gob dooms Father B. 's colony because he had to swerve to avoid an ostrich, which tipped over his box of sick bees. This is not only symbolic of the continued disappointment he brings to his father, but since George Sr. wasn't even involved in asking for Gob's help (Lucille told Oscar, who was impersonating George at the time), it's another case of a parent having no idea what their child was doing. According to mostly this, ostriches mostly lay their eggs between January and March. In Ancient Egypt, this was associated with the end of the Winter Solstice and the new year. Thus ostrich eggs began to symbolize the changing of cycles or new life. When you started seeing ostrich eggs on the ground, you new spring would be around the corner. It's like the Egyptian version of Groundhog Day. The Fourth Season of Arrested Development is primarily about new beginnings and new chances at life. This then offers the richest text for symbolism. Starting with "Flight of the Phoenix," which itself represents new birth after life both in its title and Michael's journey to begin anew in Phoeni, AZ, when Michael is attacked by Cindy the ostrich in Lucille's penthouse, it's representative of his new direction, to be explored in "The B. Team" (S4;E4). One of the more crucial changing moments in the show happens in "Borderline Personalities" (S4;E2) when a spiritual shaman (later revealed to be Marky Bark) appears as an ostrich to George Sr. and Oscar and proclaims that "The strong shall become the weak and the weak shall become the strong." Afterwards George and Oscar seem to switch personalities. The ostrich here again, symbolizes the new life for both characters. "Indian Takers" is full of this kind of stuff. Shuturmurg, India represents an attempt at a new start (see the delusions, above) for Lindsay and Tobias. Likewise, Marky Bark's ostrich farm serves as a more tangible new direction for Lindsay, away from her husband and family (for a time, at least). When Marky's ostrich, Cindy follows them to Lucille's penthouse in "Red Hairing" (S4;E8), it's the same deal. In fact, it's also explicitly the ostrich which runs Maebe out from the same apartment in "Señoritis." Michael's something car - "the ostrich," represents both a new classic AD car as well as his new life direction in "The B. Team." In "Queen B." Lucille is moved by an ostrich piñata she sees at Cinco de Quatro, which possibly merely reminds her of the breakthrough she almost had with Tobias and causes her to actually complete therapy. It causes a huge new change in her where she refuses to play the villain any more. Arrested Development in typical fashion brings this subtext directly to the forefront where she also very literally chooses to no longer play the villain in Tobias' awful Fantastic Four musical. Needless to say, Tobias understands none of the subtext. A similar event happens with Gob in "A New Attitude" (S4;E11), where he sees an ostrich shadow while contemplating revenge on Tony Wonder that reminds him of his time as a Feral Jesus trapped in a storage locker. That's possibly one of the most insane sentences ever written. Gob deals with lots of crazy feelings, from misunderstanding his own feelings of friendship for homosexual interest to his growing love/hate relationship with Wonder himself. It's all a new life. Finally, in "A New Start" (S4;E5), Lucille 2 offers Tobias a new job at Austerity after he helps her after being attacked by an ostrich. This shapes the remainder of Tobias' narrative in the show. Cindy essentially becomes a pretty heady plot device that causes many characters to take inventory of their lives and create some kind of new beginning. There are some notable episodes that don't feature ostriches, which is crazy to think that there are fewer episodes without this long running symbolic gag that episodes that contain it. These are "Colony Collapse" (S4;E7), "Smashed" (S4;E9), and the two George Michael episodes, "It Gets Better" (S4;E13), and "Blockheads" (S4;E15). This is despite many life changing moments for George Michael, in particular in "Blockheads." Perhaps this is also because George Michael is, despite his naivety, one of the more well-rounded and less delusional characters in the show. The fourth season was somehow far richer and dense than anything Hurwitz had given us before. Part of that stems from the nature of the show closely following each character individually rather than as a group. Running gags still abounded, and the random ostrich running across the screen in "Flight of the Phoenix" didn't garner an immediate payoff, but understanding the series as a whole and embracing its change is crucial to enjoying the densest comedy of all time. At least that's what the new life ostriches represent. So get your head out of the sand and get a Netflix account.